Men weighing merchandise. Side B of an Attic black-figure amphora. The economy of ancient Greece was defined largely by the region's dependence on imported goods. 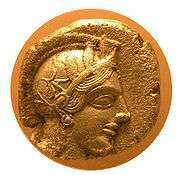 As a result of the poor quality of Greece's soil, agricultural trade was of particular importance. The impact of limited crop production was somewhat offset by Greece's paramount location, as its position in the Mediterranean gave its provinces control over some of Egypt's most crucial seaports and trade routes. Beginning in the 6th century B.C.E., trade craftsmanship and commerce, principally maritime, became pivotal aspects of Greek economic output. Greece's main exports were olive oil, wine, pottery, and metalwork. Imports included pork, Sicily, Arabia, Egypt, Carthage. ↑ Rothbard, Murray (2006). "It all began, as usual, with the Greeks". Mises Institute. Retrieved 2006-06-22.